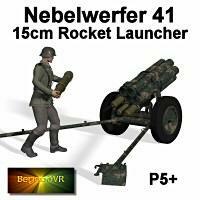 Nebelwerfer German artillery rocket launcher of WW2. Six textures and many props. Poser 5 or higher. 19.6mb zip. is there the possiblity of seeing an old feild radio sometime in the future? mac2010 (9 years ago) Inappropriate? Awe inspiring work as usual.